Turkish prosecutors have launched an investigation into Elif Zahide Tohumcu, a 4-year-old Turkish girl from Turkey’s Erzurum province, over her alleged links to Turkey’s Gülen group, which is accused of masterminding the 2016 failed coup attempt. 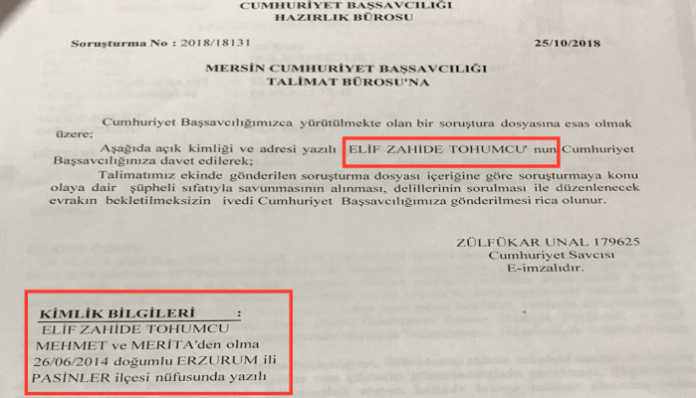 According to an official document leaked to social media, Turkish prosecutor Zülfükar Ünal (registration no: 179625) launched investigation no: 2018/18131 into 4-year-old Elif Zahide Tohumcu on behalf of the Erzurum Chief Public Prosecutor’s Office on Oct. 25, 2018. 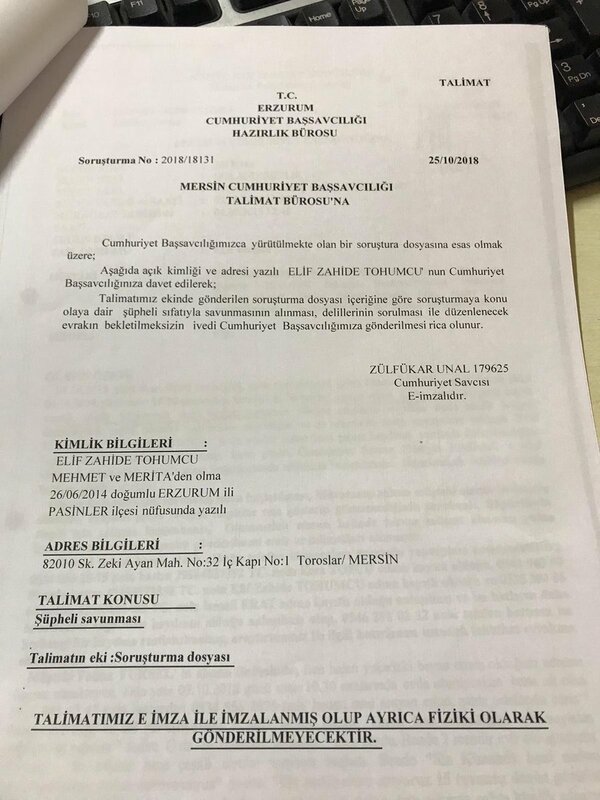 The document shows that Ünal asked the public prosecutor’s office in Mersin province, where Elif Zahide Tohumcu’s parents, Mehmet and Merita Tohumcu, reside, to take her testimony and collect relevant evidence about her. Ünal has also requested that the 4-year-old girl’s testimony and the evidence collected be sent to the Erzurum Chief Public Prosecutor’s Office as soon as possible. The document shows that Elif Zahide Tohumcu was born on June 26, 2014, in the Pasinler district of Erzurum province. There are currently more than 700 children in Turkish prisons. The mothers of most of the children in Turkish jails have been arrested as part of a government crackdown on followers of the Gülen movement in the aftermath of a coup attempt in Turkey on July 15, 2016, and most of them are in pre-trial detention and not yet convicted of a crime. The women have been accused of providing scholarships, arranging sales, depositing money in private lender Bank Asya, sending their children to schools affiliated with the Gülen movement, subscribing to the Zaman or Bugün newspapers or using the ByLock smartphone messaging application. Women who go to hospitals seeking birth control or to give birth have also been targets of the massive post-coup witch-hunt conducted by Erdoğan government.